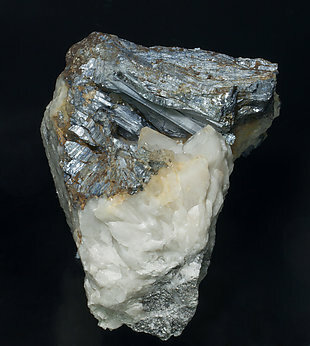 Aggregate of very bright Stibnite crystals on a Calcite matrix, with very well defined faces and edges and showing the characteristic habit of the crystals of Stibnite from this mine, very short, flattened and with excellent terminations. Radial aggregates of acicular Stibnite crystals. They are very bright and are with small Calcite crystals. Irregular aggregates of fine acicular Stibnite crystals, a lot of them doubly terminated. They are very bright, on a rock matrix coated by Quartz microcrystals. The sample is from a very poorly known locality. 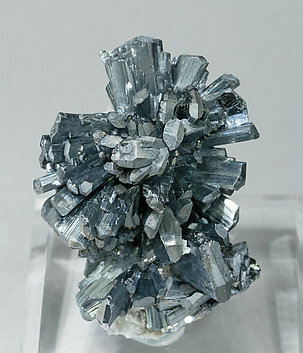 A cluster of Stibnite crystals, one of them clearly dominant, with a termination that is very rich in faces that are very well defined, bright and partially coated by very sharp and laminar Baryte crystals. 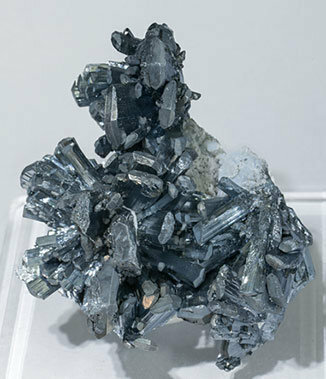 Divergent groups of Stibnite crystals, some of them with terminations that are very rich in faces. They are on a matrix of very sharp and laminar Baryte crystals. 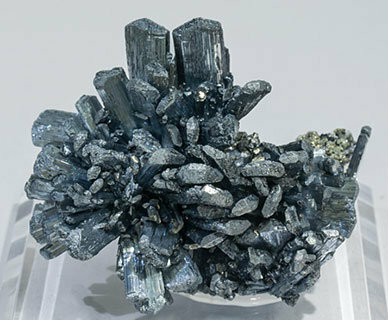 This specimen was published on the Mineralogical Record´s web page, in the ‘What's New’ section, number 42, December 10, 2015 edition. 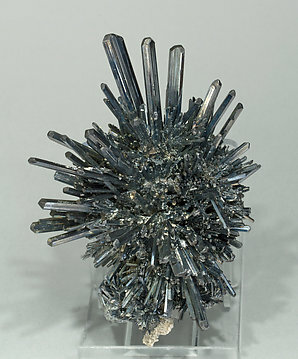 Radial aggregate of bright Stibnite crystals, elongated, with perfect terminations and with a small matrix. 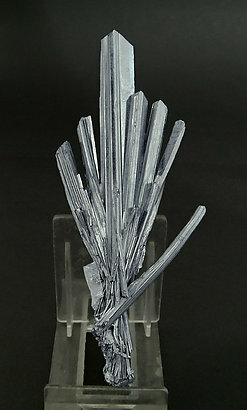 Divergent aggregate of very elongated acicular crystals. They are very bright and are with a group of white laminar Baryte crystals. An excellent Romanian classic, very esthetic. 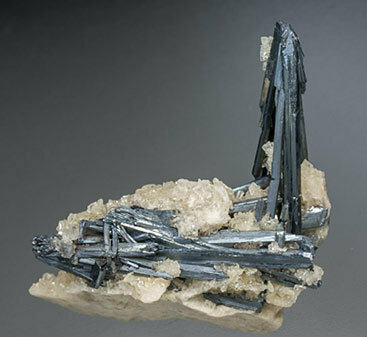 This Stibnite comes from a less well known mine in the Maramures region: Poiana Botizei in Baiut. 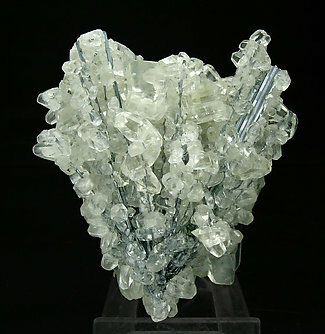 You can tell this because it is associated with white Baryte that has thick crystals, which is different from the other Baryte from the area. The specimen is also very esthetic, so overall it is a rare beauty. Crystals, prismatic, bright and sharp, form an elegant open fan that shows light and interesting curvatures in some of them. 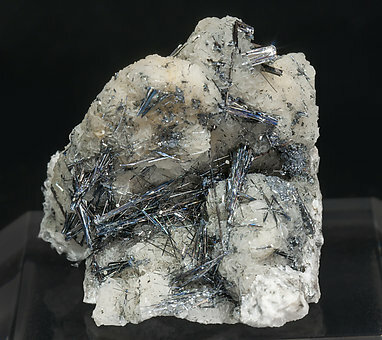 Aggregate of very bright Stibnite crystals on a Calcite matrix, with very well defined faces and edges and showing the characteristic habit of the crystals of Stibnite from this mine, very short, flattened and with excellent terminations. They are on a Calcite matrix, with Baryte. 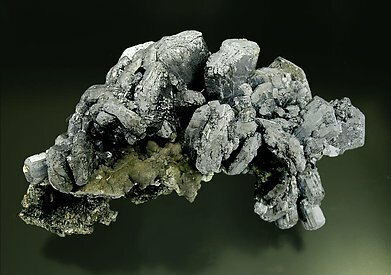 Aggregate, on a Calcite matrix, of very bright Stibnite crystals with very well defined faces and edges and showing and showing the characteristic habit of the crystals of Stibnite from this mine, very short, flattened and with excellent terminations. 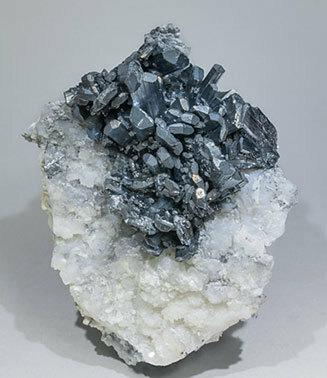 Aggregate, on Calcite matrix, of very bright Stibnite crystals with very well defined faces and edges and showing the most well-known Boldut shape, very short, flattened and with excellent terminations. 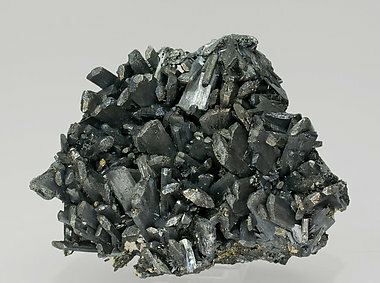 Bundled aggregates of thin prismatic Stibnite crystals. They are very bright, have good terminations and are partially coated by white Calcite. 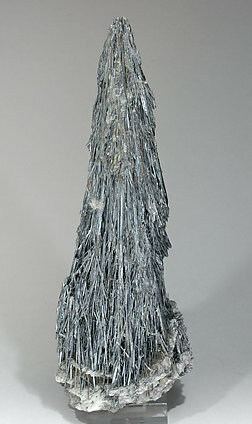 Aggregate of flattened prismatic Stibnite crystals. They are very bright, have very well defined faces and edges and good terminations, and are partially coated by white Calcite. 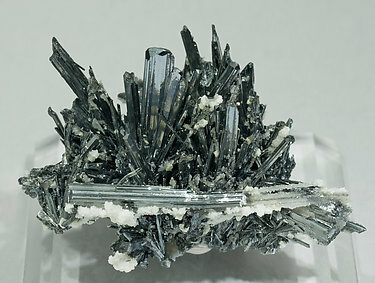 Radial group of very sharp crystals of Stibnite with perfect terminations and partially coated by globular growths of Calcite. 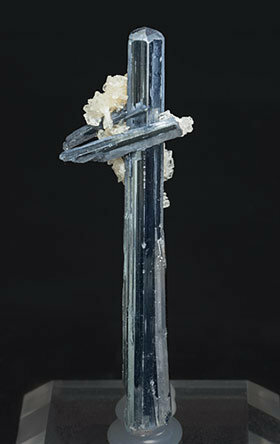 Stibnite crystals partially included in groups of scalenohedral Calcite crystals that are very transparent, much of them doubly terminated and, as a curiosity, some of them forming a “butterfly” twin. Crystals have a not so common habit because are very short and flattened prisms. 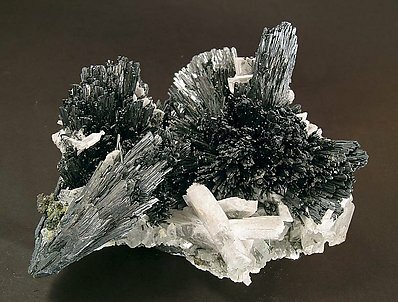 The definition of their faces and edges is excellent as is the aerial distribution of crystals on the Marcasite matrix. 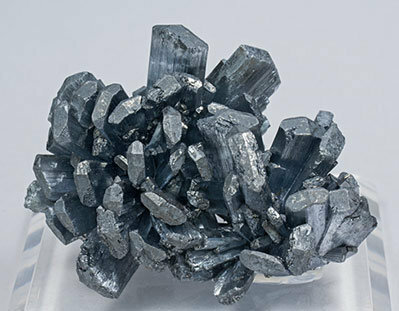 Group of thick short prismatic crystals of Stibnite, with excellent terminations, typical of the Poiana Botizei mine, a locality that in its best times offered not too many samples but commonly of good quality. With a label from the Joan Abella i Creus collection that we’ll send to the buyer. Parallel aggregates of Stibnite crystals with very well defined curvatures. They are very large for the locality as is also true for their definition and luster. They are on a Quartz matrix with some very well defined crystals. Very unusual, as are many of the samples from this collection. 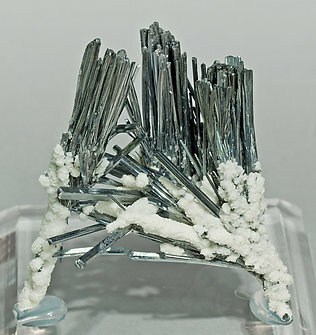 It is not a Stibiconite, as these are often labeled. 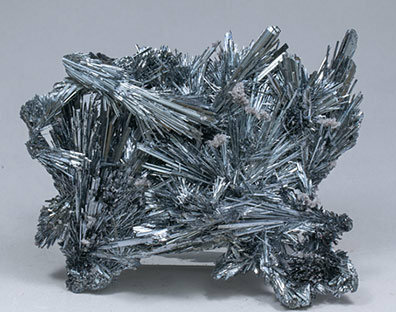 We have analyzed it and we can confirm that it is a Stibnite that is covered with native Sulfur. 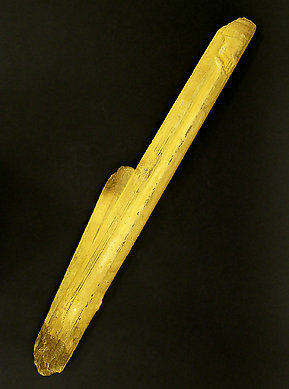 The crystal is quite large, with perfectly defined edges and faces and it is almost completely covered by the sulfur, which makes it a neat yellow color. As we normally do in these cases we will send a copy of the analysis.